$0.99 (regularly $3.99) 10/6/2016 - 10/8/2016! Stop letting your fears and insecurities dictate your life. Stop letting them kill your dreams and reduce you to a life of pain and misery. 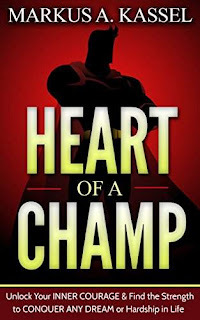 With "Heart of a Champ", discover what it takes to let the inner champion in you out and change your destiny! Are You Tired of Constantly Holding Back and Living in Fear? Do You Wish You Had Enough Courage to Go for Your Dreams and Live the Exciting Life You Thought Reserved Only for a Select Few? What you need is a way to unleash the inner hero you’ve been keeping trapped inside. What you need is a plan to set free the HEART OF A CHAMP! Courage Is but a Habit to Develop – Here’s How! With the lessons contained in HEART OF A CHAMP, you’ll come to realize that you already possessed the same inner power as those heroes and athletes you admire. It was just sleeping. You’ll discover the step-by-step to tapping into that infinite strength and changing your existence in ways you couldn’t even fathom. When you’ll have started following these principles, you will see a new, marvelous world opening to you. Where no challenge will be too big. No fear will be able to stop you. You will have erased the word “impossible” from your vocabulary and you will find you’re now able to achieve any goal you set your mind to. For you will have become the true master of your destiny!